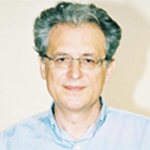 Panagiotis Argitis is Director of Research at the Institute of Nanoscience and Nanotechnology of NCSR Demokritos, leading the research activity on Materials for Lithography and Organic Electronics. He is a Chemistry graduate of the University of Athens and holds a PhD from the same University (1987). In 1988-1991 was a Postdoctoral Researcher in University of Texas at Austin. His current research interests include new lithographic materials and processes for nanoelectronics and microsystems, and investigation of molecular materials as components of electronic and photonic devices. He has published more than 135 journal papers and 40 conference papers and is a co-inventor of 12 patents or patent applications (h-index 27). The advancement of Organic Photovoltaics (OPVs) technology is now considered as one of the main research topics in the area of next generation Solar Cells. OPVs are based on organic semiconductors as the main materials in their photoactive layer whereas different material and device architecture options have been investigated for efficient charge generation, transport and extraction to the corresponding electrodes. The power conversion efficiency has currently reached 12% in cells with tandem architecture giving promises for near-future implementation of the technology in specific applications. The current research in this area which focusses on issues related to material alternatives, optimized architectures and scale-up issues will be briefly reviewed along with specific examples of devices based on solution processable materials introduced by our group.